Disney Pixar’s Toy Story is one of those series that tugs at every single heart string, but it turns out there are few more to pull... as Andy’s dad might have one of the saddest stories in Pixar history. Over the past several years, rumors and theories have circulated about why Andy’s dad wasn’t around during any of the Toy Story films. The general consensus has been that either Andy’s parents are divorced, or his dad died. It looks like it’s the latter, but let me give you a fair warning: However bad you think that story might be, it’s actually much, much worse. During a livestream earlier this month, toy product designer and reviewer Mike Mozart shared that he’d served as a toy consultant for Toy Story, helping his friend Joe Ranft, Pixar’s former head writer. Before Ranft passed away, he reportedly shared the secret history of Andy’s dad with Mozart, which he called Toy Story 0. Mozart promised to give more details, which he since has in a video with YouTuber Jonathan Carlin, part of the Super Carlin Brothers. This isn’t official, but Mozart is a trusted figure in the Pixar community... so I’m taking him at his word. Update: Looks like his word might not be enough. Andrew Stanton, who co-wrote all three Toy Story films (and the upcoming fourth film), has disputed Mozart’s claim, calling it “complete and utter fake news.” Now, it’s possible Ranft had his own origin for Andy’s dad that wasn’t shared with the others, but that’s not something that can be verified. In any case, Mozart’s story looks to be his own. We’ve reached out to both Stanton and Mozart for more information. So, here’s the thing: Andy’s dad had polio. 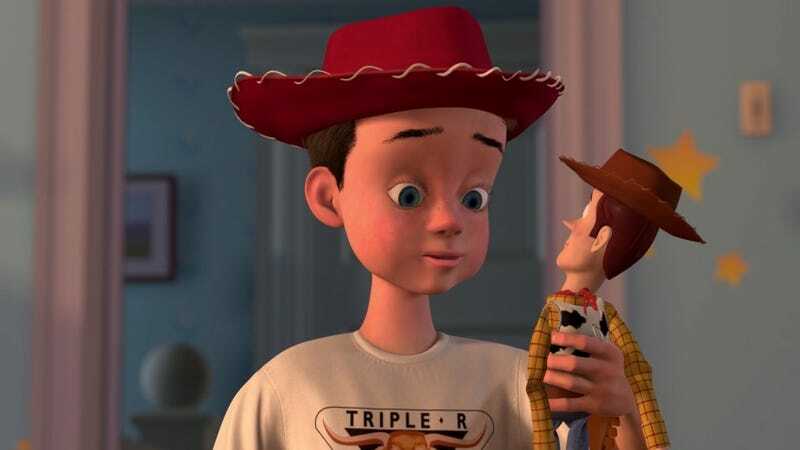 According to Mozart, Andy’s father was also named Andy, and he was the one who grew up with the Woody doll (it was his name on the boot). He was the only kid in the world who had one because he’d received a one-of-a-kind prototype from the cereal company. The toy didn’t get mass-produced because the show had just gotten canceled. Sadly, around 1959, Andy Sr. contracted polio and most of his toys were destroyed for his safety. That is, except for Woody, Slinky, and Mr. Potato Head, because Andy Sr. crawled out of his bed (without the use of his legs) to save them from being burned, and hid them in a box. Andy Sr. later recovered and went on to get married and father Andy Jr., the Andy we grew up with in the Toy Story series. But his recovery didn’t last forever, as he was later stricken with Post-Polio Syndrome. They moved into Andy’s grandparents’ house to survive, which means the child pictures on the walls were actually of Andy’s dad (makes sense, since he’s wearing glasses). Then, you’ve got their final moment, which rivals the first 10 minutes of Up for heartbreaking sadness. Andy’s father calls Andy over to his bedside, giving him a key from his wallet and telling him to go bring down a chest in the attic. Andy heads up there and grabs the chest, but by the time he returns downstairs... his father is dead. Andy forgets about the chest and the key, only to open it after the funeral. Woody, Slinky, and Mr. Potato Head wake up from their slumber, see Andy Jr., and believe he’s the kid they grew up with all those years ago. They don’t know their original owner is dead; Andy lives on in his son. This explains several things from later on in the series: why Woody doesn’t remember he was part of Cowboy Crunchies’ Woody’s Roundup, since he was created right before the show was cancelled; why the handwriting on Buzz’s foot is different than Woody’s, because they were from two different people; why Al saw Woody as so valuable... since he was a one-of-a-kind toy (it does make you wonder what other Woody toys there were, though, since there were toys for Jesse, Stinkin’ Pete, and Bullseye). So there you have it, the “real” story of happened to Andy’s dad. Hope you’ve got an extra box of Kleenex handy.